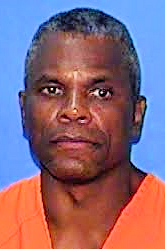 John Errol Ferguson was executed by the state of Florida on August 5, 2013. John was pronounced dead at 6:17 pm EDT, inside the execution chamber at the Florida State Prison near Raiford, Florida. John was 55 years of age. John was executed for the murder of 35-year-old Charles Cesar Stinson, 37-years-old Gilbert Williams, 26-year-old John Holmes, 35-year-old Henry Clayton, 24-year-old Michael Miller, and 33-year-old Livingston Stocker on July 27, 1977, during a home robbery. Forty-five-year-old Johnnie Hall and 24-year-old Margaret Wooden were also shot during the home invasion. They survived their injuries. John also shot, killed, and was sentenced to death for the murder of 17-year-old Belinda Worley and 17-year-old Brian Glenfeldt, who were parked on a “lover’s lane” on January 8, 1978, in Hialeah, Florida. John was also convicted of the attempted murder of another couple on a lover’s lane a few months earlier. John was also suspected in a fourth murder. Please pray for peace and healing for the families of Charles Stinson, Gilbert Williams, John Homes, Henry Clayton, Michael Miller, Livingston Stocker, Belinda Worely, and Brian Glenfeldt. Please also pray for peace and healing for Johnnie Hall and Margaret Wooden, their families, and any one else who may have been hurt by John. Please pray for the family of John.